We had a short 1D2N stay in Jeju, far too short in my humble opinion. 7 activities (including all the places we ate at, that would be 10 destinations) were lined up for a single day, leaving us dead beat by the time we returned to our hotel. Nonetheless Jeju’s such a charming place so much so it was easy to summon up energy every time we step out of our bus. 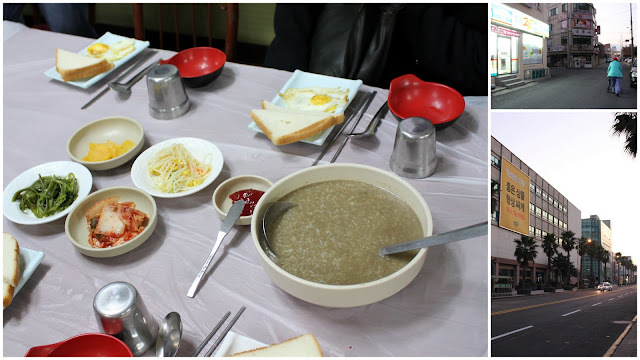 Started our day bright and early with a breakfast for champions: tasty abalone porridge, banchan, toast with strawberry jam made in Jeju, and a sunny-side up for more protein. The early bird catches the worm right? Because we were the earliest to reach the mandarin orange orchard, we had the luxury of picking the prettiest fruit and peeling them right on the spot to eat. Tart and sweet, it managed to satisfy my craving for fruit partially. 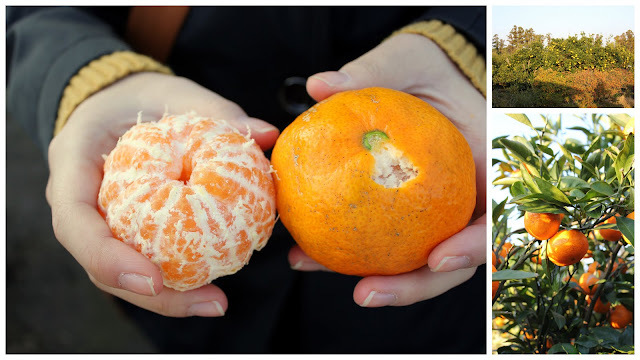 Jeju’s famous for their mandarin oranges. Sources indicate that they are of a species called satsuma or unshiu mandarin, a type of Japanese orange tree. Whatever the origin, the tourism industry in Jeju certainly caught on and now shops churn out things like orange chocolate and orange crunch. Of the two I would recommend the latter if you really have to buy something because the former really tastes like the usual cheap orange chocolate you can get into supermarkets. But the most amazing experience I had that took my breath away was at Seongsan Ilchulbong Peak. It was a steep hike up to the volcanic crater which is 180m above sea level, but worth every step! Such a spectacular view, and the climb isn’t that difficult. A great deal I would say! Jeju is created entirely out of volcanic eruptions, thus explaining the abundance of craters as you can see in the photo. Since Seongsan is located at the easternmost end of Jeju, it is the first to meet the sun everyday. Pity we didn’t get to witness the sunrise, next time perhaps. On the other side is the volcanic crater which is 600m in diameter and 90m high. One steep climb for 2 views- really this should not be missed while you are there! Horse riding, and visiting Seongup Folk Village were a couple of other things we did before we finally arrived at our lunch stop. 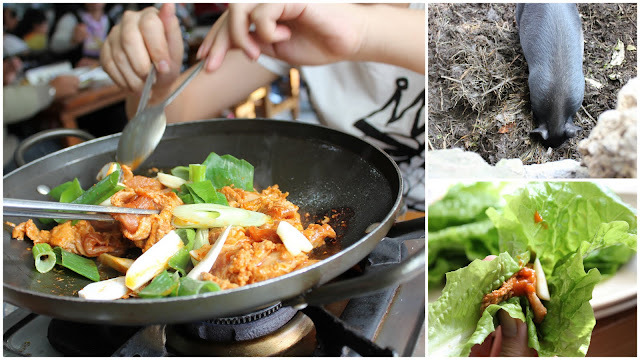 We had marinated pork hot plate, the pork coming from black pigs which is a breed special to Jeju. Yup, it’s that little guy you see on the top right of the collage. By then we were experts in making lettuce wraps. Pile on meat, garlic (grill it if you dislike the hiam-ness), and smear on some hot sauce (hot sauce goes with everything). You can choose to add some rice (which is normally done) or kimchi but don’t overdo it because you should be stuffing the entire lettuce wrap in your mouth. Honestly I couldn’t taste the difference in the pork used because the marination overwhelmed any subtle flavours the meat had. In any case, it was delicious. I was overjoyed when I discovered a fruit truck across the road from where we ate. Made a beeline for it and immediately bought a box of strawberries and two ginormous apples (not the tiny ones you see there). I’ve learnt from our fruit seller at home that those were probably huge fuji apples from the USA that are in season now. But those strawberries, they were 100% korean. This batch wasn’t as sweet, probably along the standards of what I can get from our fruit seller but the other batch I bought earlier in Seoul was so sweet that calling it candy won’t be an exaggeration. We had a hearty meal of ginseng chicken for dinner. First year rejects are used that’s why the price of ginseng chicken isn’t eye-poppingly expensive. The whole chicken is stuffed with glutinous rice and red dates that impart a sweet flavour to the stuffing. For those who hate ginseng, you’ll be glad to know that the pungent smell is kept to the minimum. I could handle it though I dislike ginseng. We dunked the noodles in the soup which came boiling hot. Soft silky noodles were a pleasant change from rice. 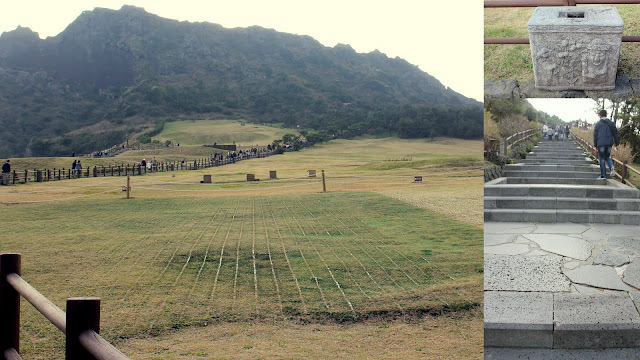 We did a whole lot of other things in Jeju of course. Visited the Teddy Bear museum, Glass Castle, Trick Art Museum, drove on the Mysterious road, went for a Nanta performance (yours truly got called up on stage as a volunteer :O), was underwhelmed by the Dragon Head Rock and made a couple of good buys at TopDong Street. The itinerary was packed but we enjoyed every bit of it!